Look at the pictures and watch the video below and unpack a seed on the devastating Oklahoma Tornado. Think about what you see, hear, feel, taste, smell. Write down any major facts in your seeds and remember to include a RAFT. You will then go on with a descriptive piece of writing (draft) about the tornado. You may wish to write a snapshot about one particular moment or write a descriptive recount describing what it would’ve been like to be surrounded by the tornado. – Similes Eg: The unpredictable tornado was spiralling like a giant whirlpool. The devastating tornado roared towards us like a pride of lions. – Complex sentences like we have been using in class Eg: In the afternoon, when the sky was dark and stormy, the destructive tornado spiralled out of control, destroying everything in its path. It started as the trees were swinging out near the bush, and then it came towards us… A huge, terrifying TORNADO. The sound of hail stones was pounding everywhere, making us so scared and frightened to be there listening, A giant crack of lightning struck through the sky. It was like the world was going to end. The roar of the massive tornado was dreadful deafening. Houses were getting ripped apart by the powerful winds as frightened people ran screaming for their lives. The sound was constant and became louder as we become horrified. The Giant Tornado destroys everything in his path like a group of rhinos running from a predator. There’s an annoying whistling noise coming from the Tornado while it’s powerfully ripping the trees out of the ground like its sucking juice with a straw. People are screaming for they life. I’m staring at the Tornado and I’m feeling paralysed and thinking is it going to get closer. Suddenly I see a devastating lightning bolt. I’m feeling that I’m going to DIE TODAY! During the afternoon, as the sky turned dull and the wind got powerful, the savage tornado ripped up the threatened town of Moore. The terrified people flee the area screaming and hoping they will survive. All I can think of is the huge tornado destroying everything in its path like an out of control freight train. I am trying to keep my balance as the powerful gusts pound into me like a wild rhino chasing its prey. My eardrums feel like they’re about to explode from the deafening sound of debris being slammed together. The crack of the thunder and the roar of the tornado sounds like hundreds of exploding petrol tanks. I can taste the devastation of innocent families as they lose everything they have ever loved and everything they have ever lived for. I’m so shocked as I stand here wondering why I’m still here, as I try my best to stay calm. The hailstones slam into me. I stand there feeling guilty knowing I can’t help the poor people being killed, injured and losing their homes. I see a dark clouded tornado picking up everything that’s in its path. Roads are getting torn up into billions of bits and houses are getting destroyed. People are screaming and shouting, even running for their lives, trying to get away from this giant tornado. It’s so noisy it sounds like a huge explosion just went off. Dirt and dust is going into my mouth like I’ve been given hells dessert. When the tornado hit Oklahoma, everyone was horrified and the government was terrified to lose everything. The tornado was dark, fat and disgusting. It roared like a pride of hungry lions as it ripped up houses and trees. After the tornado left Oklahoma everyone was stunned and some medics helped badly injured people, some have died from the deadly tornado. Some people have bunkers underground and have food and drinks to survive. Some people have no houses to live in after the tornado so they live in bunkers. In the afternoon, the town of Moore in Oklahoma was almost destroyed by a vicious tornado. I ran trying to get to safety, when the vicious tornado hit. The terrifying tornado destroyed everything in its path. Lightning bolts struck, hail stones the size of a golf balls fell and rain flooded most of the town. It was horrifying. The tornado was as loud as a pride of lions. The screams of other people made me terrified. The hail stones sounded like the rain was bucketing down. The smell of disgusting mud was really gross. The dust from the tornado smelt awful as it kept on gathering more dust in its path along with trees and houses. It’s as cold as ice I was shivering trying to get warm. I felt like something was going to hit me like a tree flying through the air. In the stormy, devastating and grey afternoon, when the grey clouds were gathering together to make a huge and unforgettable storm, the tornado rose and created a huge and massive destruction around the city of Moore. Everybody screamed and evacuated like a huge pack of wolves. My eyes are visualizing a terrible twirling twister creating huge destruction around the large city. Debris is lying around the giant and dangerous twirl of the wind. Everybody is horribly starting to shockingly scream and at the same, people are frantically driving away to avoid the terrible twirl made of wind. Hail stones are stomping down on my head; meanwhile extremely big clumps of rain are falling onto the hard ground. My ears are sensing the engine of cars roaring as the cars are speeding and zooming past my ears. People are horrifyingly so terribly loud, my ears are aching. The pedestrians are screaming for help because the terrifying twister has smashed and destroyed everything in their path. Lightning bolts are making the sounds of a piece of paper viciously ripping loudly in the sky. Hail stones are smashing on the ground like popping popcorn. The destruction of what the terrible and horrible twister has caused is filling up in my nose. What everybody has experienced through this mad tornado is sadly running through my body. I can smell the horrible gas squirting out of the rushing cars. My mouth is sensing the horrible fumes from the smoke of the cars frantically rushing away the tornado. The terribly strong wind is colliding into my mouth. Peoples fear is running through my wide and speechless mouth. I am huffing and puffing from quickly running away from the harmful tornado. My body is getting hit by bits of ice. My emotions are completely mixed with being terrified, horrified and absolutely shocked. The strong wind is streaming with force through the thin air. 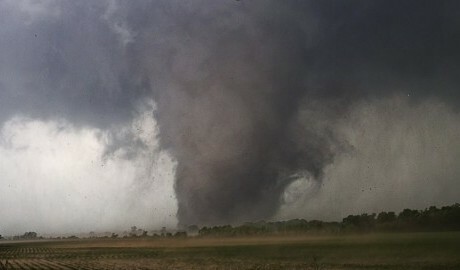 During the afternoon, when a loud sound roars, the tornado spins around the field, smashing homes and other properties. As I saw the huge and disruptive tornado coming towards me, I looked puzzled and felt like I was just having a nightmare. All I could hear was the loud roaring of the tornado getting closer and closer to us. The sound of the branches breaking and the houses crushing down was really disruptive and it was disturbing me. The way I felt was really horrified having to see all these houses and people being pulled away from their homes. “As I started to wonder why the tornado hit Moore and Wellston instead of another town in Oklahoma?” I started to tremble more and I started to feel terrified as the tornado hit a house and sent it flying up in the air. I think that the tornado was really dangerous because it was really loud and it was roaring like a pride of lions angry at something. The tornado is spinning in a spiral picking up everything that is in its path. I start trembling and shaking as the tornado gets closer and closer to me. All I can hear is all the people running away in fear yelling and screaming of fright, the amount of people trying to drive away in cars from the tornado have a chance of getting killed because the tornado is really scary and dangerous. The sound of the people screaming is just making me much more scared and frightened because of the loudness of the people screaming. The tornado struck the place next to my house and the tornado left a really huge wind blow. In the afternoon, when the tornado wind blows, the houses were shaking and waving side to side, I fall down from the huge wind. The small town I live in smalls disgusting from the terrible caused by the huge tornado. During the afternoon, as the sky turned dull and the wind got powerful, the savage tornado.I can see a dark clouded tornado picking up everything that’s in its path. And going everywhere, going up and down around my place. Hear people screaming and they are scared because they don’t know what’s going on. I’m wondering how do the tornadoes goes up huge like that. And I wondering where the tornadoes come from. I’m feeling scared because might I die because I smell the terrible tornadoes and I don’t know where it come from! I might lose all my family. I think that the tornadoes was really disgusting because it was really loud and it was roaring like a pride of lions. In the afternoon, when it’s all dark and the clouds come together as one, there is the rush of massive tornados coming towards me and I try to run. The crushing tornado is speeding towards me as the noise gets so loud it hurts my ear drums. It’s out of control and is destroying everything in its path. I feel like I have already died in this terrible dangerous, horrifying tornado because some of my best friends and family have already have died. I feel like I want to die too because I don’t want to live without them. I wish this terror could just go away so…GO AWAY NOW…bye…WHAT DID I SAY? Crack goes the roaring tornado behind me I turn around to see a huge raging tornado charging towards me destroying everything in its path. Everything is getting ripped into shreds the crack of the thunder is so loud its making my ears bleed. I’m so shocked I don’t know what to do. The sound of the roaring wind with the wild tornado was deafening as it destroyed everything in its path. The dust in peoples mouths and tasted disgusting ,while the wind blew everything that lay on the strong ground. Trees were left with nothing on them or were ripped out of the ground. Some people lay dead, others left scared, shocked and frightened. They thought that they were almost dead. Shocked that a strong wind and a wild tornado was killing people . Everything crashed to the ground and was falling. The tornado was creating thunder. Hail stones the size of a golf balls crashed to the ground. The tornado sounded like a pride of lions roaring. Houses lay like rotten apples on the hard cold ground. I feel sad for all the people who have lost their lives and homes. I don’t want anything to happen like that ever again. A massive tornado is hurtling towards me destroying everything in its destructive path. The gigantic tornado is obliterating everything in its path, trees are being uprooted by the destructive force of the winds, twigs, leaves and branches are flying everywhere like a terrible blizzard. I am blinking rapidly as the rubble comes flying into my eye making it impossible to see. I am blown off my feet by the destructive 200 kilometres per hour winds. At first the pain is excruciating, but after a while it starts to rapidly fade. I look at the devastating aftermath, it makes me feel sad. All the life from that area has just vanished like me eating an irresistible scrumptious tasty bag of wonderful lollies. Trees are extremely lucky to have roots. Trillions of things have just been obliterated by the raging tornado.